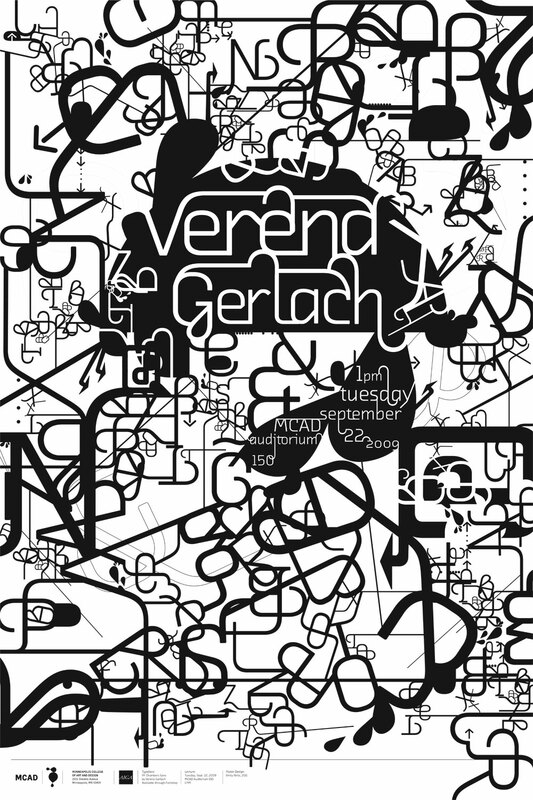 Above: Lecture poster for Verena Gerlach by MCAD student Emily Reile, 2011. Verena’s presentation (Sept. 22, 2009, 1PM, MCAD Auditorium 150), is sponsored by the MCAD Design Department and AIGA Minnesota, and is open to the public. All are welcome! Look for updates soon on a workshop with Verena and the neue typonauten from grd_3020_f09. For this poster, Emily was inspired by her prior experience with Verena’s FF Chambers Sans (Fontshop). Herzlich Willkommen, Verena. Sauber, Emily! Such a great poster, Emily!! I love it. With such intimate relations to Chambers Sans; I feel it absolutely necessary to hear Verena talk about her experiences. Looking forward to insights. Wahhhhhh, she’s coming next week?! Ohshit, hope Jan doesn’t mind me going to this! Verena Gerlach / MCAD_Emily Reile: Ein Berliner in Minneapolis. World Famous Design Junkies was at the lecture (of course) and live-twittered the entire lecture! Muchas Gracias, Chris Burns! First of all, take a look at this link here: http://bit.ly/ggTIu This is where we are. It was my pleasure, and it was wonderful to meet her, too! This entry was posted by Erik Brandt on Wednesday, September 16th, 2009 at 9:55 PM	and is filed under Aktuell, Education, Geotypografika, Graphic Design, International, Internet, Musica Viva, News Links, Typografika, Typography.